Please note Palm Fronds Leaves and Stumps are no longer acceptable as green waste. Click to enlarge and open in new window. Recycling services are included as part of the City’s contract with WM so there will be no extra charges to add recycling services to your account. In fact, you may be able to save money on your bill by reducing your garbage services with the addition of recycling services. Recycling is good business - Businesses and multi-family properties that reduce waste are regarded more favorably by customers, the public and their own employees. When they reduce waste, they motivate people and other businesses and properties to do the same. Mandatory Commercial Recycling is Here! Starting July 1, 2012, it will be mandatory for most businesses and multi-family to recycle! In October 2011, the governor signed AB 341, which requires the following to arrange for recycling services by July 1, 2012: (1) any business that generates 4 cubic yards or more of waste per week, and (2) multi-family properties with 5 or more units. 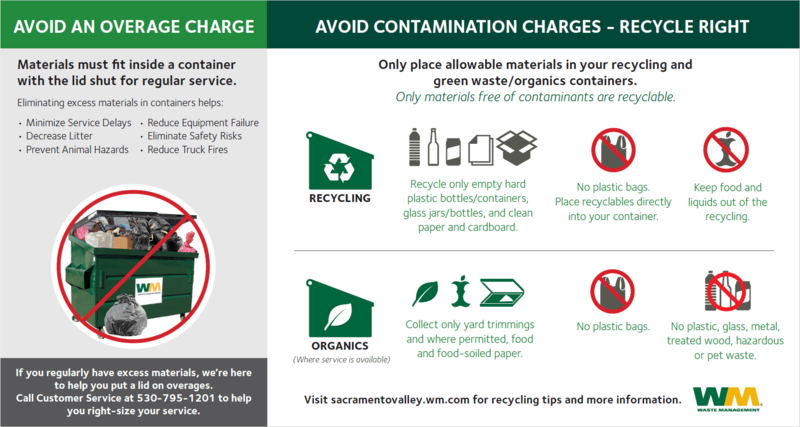 If you would like more information to determine if your business or property meets these thresholds or if you would like to arrange for recycling services, contact Waste Management (WM) customer service at 800-374-4778.